Bea's Book Nook: Bea Reviews Fatality by Firelight by Lynn Cahoon, with A Giveaway! 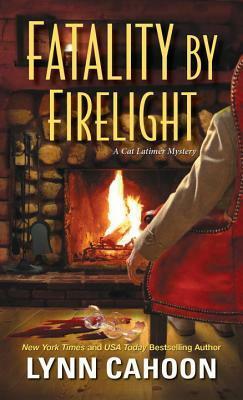 Bea Reviews Fatality by Firelight by Lynn Cahoon, with A Giveaway! Next thing Cat knows, her uncle, the town sheriff, informs her that the young man’s been found dead in a hot tub—and Christina shows up crying and covered in blood. Now, between a murder mystery, the theft of a rare Hemingway edition, and the arrival of a black-clad stranger in snowy Aspen Hills, Cat’s afraid everything’s going downhill . The Cat Latimer series has an interesting premise, with a B&B owner who offers monthly retreats for writers. And since this is a cozy mystery series, those retreats also include a death. Then there's an overarching mystery that runs through the series. Add in some romance and you've got a packed story. It's the second month of Cat's new retreat service and she's both excited and nervous. She's more introverted than you'd expect from someone in the hospitality business but fortunately she has her friend Shauna to help out. Shauna's also the cook, and yum, I wish she cooked for me. This retreat has a young romance writer with bad judgment in men and before long she's embroiled in the murder of a local man. AS if that weren't enough, she has a stalker back home that she's also dealing with. Add in complications with the local college and a possible Mob hit man in town and Cat is busy keeping her guests safe while fulfilling her duties as hostess and trying to figure out her relationship with handyman and boyfriend Seth. Cahoon writes a twisty mystery full of details and interesting people. I accurately guessed at parts of the mysteries while I was wrong about others. There was one aspect that that seemed very obvious to me but it took the characters a lot longer to figure it even with clues taring them in the face. The self-contained mystery and the larger series-wide mystery intersected in this story and I'm curious to see where Cahoon goes with it. I do have concerns about the sustainability of the series. This story was set a month after the first book so it's only the second retreat and both had had murders. Obviously if this keeps happening, the B&B will lose business. Then there's the pacing; if each book is only a month after the previous one, the series will quickly fall behind the real world timeline which will make writing the stories more challenging, and of course, having a murder occur every month, with every retreat, will seriously strain credulity. It was good to see that Cat was worried about some of these same things so maybe Cahoon is already working on solutions. "Fatality by Firelight" gave us a story with a small town setting, rich characters, intriguing mysteries, and enjoyable insight into being a writer. I was caught up in Cat and Shauna's lives and left wanting to know more about Cat's own personal mystery. "Fatality by Firelight" was a fun weekend read. Thanks for reviewing Fatality by Firelight! I really enjoyed this as well though the sustainability did cross my mind! That's a lot of murder for one small town though no one seemed to upset about it on Murder She Wrote! Oh, I questioned it with Murder, She Wrote. :D But I'll keep reading this series to see what happens. I've enjoyed some other books by Lynn and this one sounds like fun too. A writer's retreat in Colorado and a murder sounds like a great read. Can't wait to read.